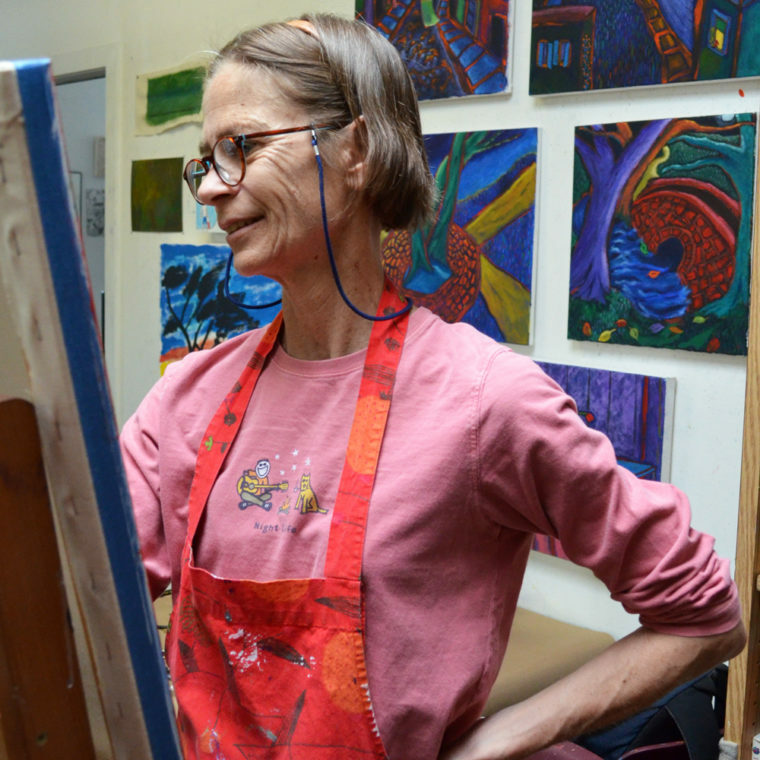 Studio A provides ongoing professional support for artistically talented adults with psychiatric disabilities, Autism Spectrum disorders, mental illness, and head injuries. This unique program offers opportunities to pursue professional art careers within a small, supportive community of approximately 30 dedicated artists with similar experiences. Artists come to the program with varying degrees of formal artistic training, and work independently in a less structured, yet equally supportive environment. The program promotes self defined goals and encourages artists to focus their time on the creation of artwork to be exhibited and sold. Each artist comes to the studio on an individually scheduled basis. Studio A was established as a studio within Gateway in 1997. In response to a growing need for alternative arts-based services for individuals with psychiatric disabilities in the late 90’s, Gateway Arts acquired additional studio space and developed programming to serve and support a new group of artists. This program provides not only work space, but also access to high quality art materials and representation in our gallery, store, and online. Studio A is not just a work space, but a community of artists, mentors, and friends. The professionally trained program staff are artists themselves, and are available to participating artists for art facilitation, career suggestions, and sensitive critique. Staff members work with counselors, therapists, and support teams to provide each artist with coordinated services, artistic mentorship, and assistance with their individual challenges. Read our Studio A Brochure to learn more. CALL US at (617) 734-1577 to schedule a tour of Gateway, see firsthand the exciting studio space, learn more about the program, and meet with staff. Interested artists are encouraged to bring samples of their work. Contact Studio A Supervisor Carolyn Burns at (617) 734-1577 (voicemail extension 25) or burnsc@vinfen.org for more information.